Edmund Wagner was born on 5 December 1914 at Neuhäusel-Kirkel in Saargebiet. Wagner was posted to JG 51 in the summer of 1940. 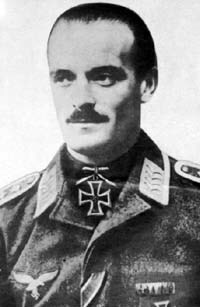 Oberfeldwebel Wagner was assigned to 9./JG 51. He gained his first victory during Battle of Britain when he shot down Spitfire fighter on 14 September 1940. He gained his next victories during the invasion of Russia, when he shot down five Russian SB-2 twin-engine bombers. A meteoric start to his combat career! Wagner continued his initial success by claiming a further five SB-2s shot down in the next two days to raise his victory total to 11. He claimed his 20th victory on 11 August, when he shot down a Russian I-15 biplane fighter. On 10 September, Wagner was escorting a reconnaissance aircraft when the formation came under attack by five Russian I-61 fighters. Wagner succeeded in shooting down four and severely damaged the fifth to raise his victory total to 27. He safely escorted the reconnaissance aircraft back to its base. Wagner recorded his 30th victory on 22 September and his 50th on 27 October. In total, Wagner claimed 22 victories in October. On 13 November 1941, Wagner engaged a Russian Pe-2 twin-engine bomber near Pawmutowka. His Bf 109 F-2 (W.Nr. 9693) “Yellow 1” was hit by return fire from the bombers and he crashed to his death. Wagner was posthumously awarded the Ritterkreuz on 17 November. Edmund Wagner was credited with 56 victories. He recorded 55 victories over the Eastern front. 6:00 Pe-2 9./JG 51 15km E Duchowscht.